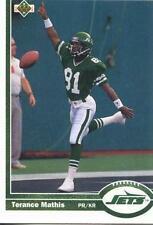 This item is the 1995 Fleer Ultra Touchdown King Terance Mathis. WE ARE ALWAYS PURCHASING CARDS. SINGLES, COMPLETE COLLECTIONS. TURN YOUR CARDS INTO FAST CASH. TERANCE MATHIS. Only 25 of each FINESSE GOLD card were produced; this Mathis is serial-numbered #10/25! 1999 Playoff Contenders SSD. FINESSE GOLD Parallel #55. Atlanta Falcons. Card is in MINT condition (see scan). You are buying one 1997 Pinnacle Totally Certified Platinum Red Football Card #106 Terance Mathis Serial number 2793/4999! Nice card of Mathis!! 1998 Absolute Hobby Silver #143. Each Card is limited and stamped "Millennium Collection" on the front. These were only available is special limited edition factory Sets. Cards are in Nrmint-Mint Condition. Good Luck. Card is in Mint Condition. Good Luck. All Cards are in Mint Condition. Good Luck. 1998 Playoff Contenders Tciket Proof Set Terance Mathis #4 (#1/1)! A great addition to any player collector, set builder and Atlanta Flacons Fan! TERANCE MATHIS. 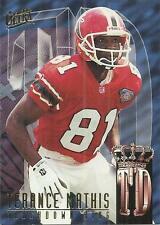 2001 Upper Deck card #10 Terance Mathis. This is the gold parallel version that is serial numbered #66/100. Nice card for any big football collector.Card is Nice.Check out scan. ANY SCRATCHES OR LINES ARE FROM THE SCANNER NOT THE CARD ! This item is the 2000 Fleer Ultra Fast Lane Terance Mathis. Card # 8 of 15 FL. Card is Mint. Photos/Scans provide best detail. Always Buying! Feel free to combine S&H over any 48 hour period! It's Terance Mathis' 1998 Skybox Thunder Rave card #158. RARE TERANCE MATHIS SERIAL NUMBERED CARD. Stamp(s) will be placed inside a plastic bag for protection. Each card will be placed in a soft inner sleeve within a Top Loader. 1998 Upper Deck SPx Terance Mathis # 195 Serial # 3948/5050 Football Card. All ungraded cards are at least in NRMT-MINT condition or better unless stated otherwise. 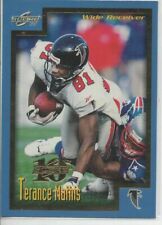 This is a 1999 Upper Deck Super Bowl XXXIII Terance Mathis Card. Card is in Nrmint-Mint Condition. Good Luck.